If any of your were wondering what I opted to wear for my first day of London Fashion Week, then here's some pictures of my look. I ran out of time to take any pictures myself, so I was quite lucky that a lovely lady from the French newspaper, L'Express, asked for my picture in the courtyard of Somerset House. 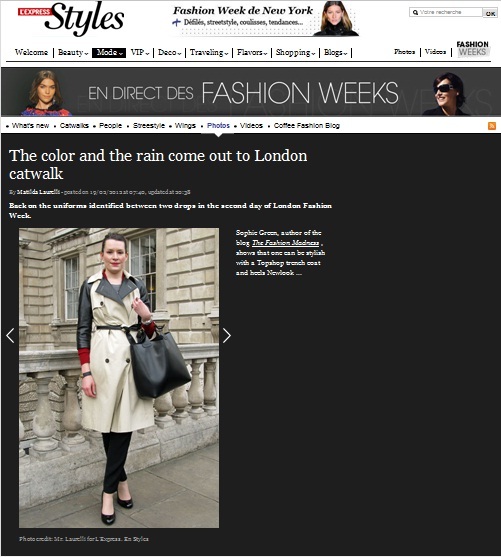 I'll be honest, this isn't the best picture ever taken of me (I definitely need to perfect my street style pose for future; I don't have a double chin in real-life, honest) but I love the L'Express write-up (including link to my blog...) and the fabulous second picture of the closer details. 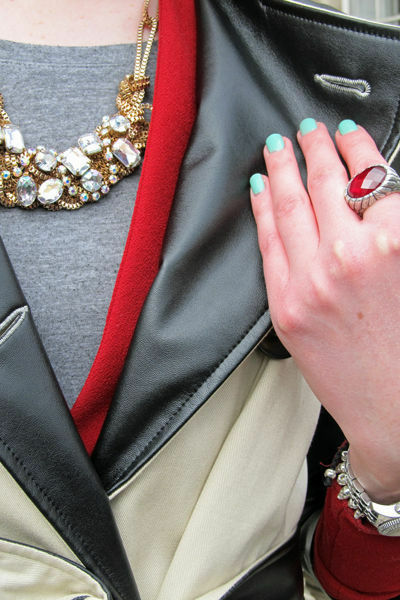 I'm wearing my favourite Topshop contrast sleeve trench, New Look courts, Zara tote & red blazer, Thomas Sabo watch & ring and a Forever 21 necklace.